Amaltas ka Guda, Tukhm Khatmi, Sapistan, Sana Makki, Unnab, Shakar Surkh, Shakar Safaid, Sat Leemun, Roghan Alsi. 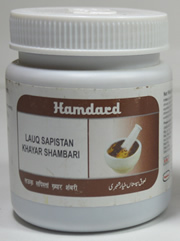 It is very useful to treat cold, cough, catarrh. 10 grams to be dissolved in luke warm water to be taken in the morning and evening.